After we learned that a couple had spent a lot of their relationship moving around, we suggested a geography-themed wedding suite. 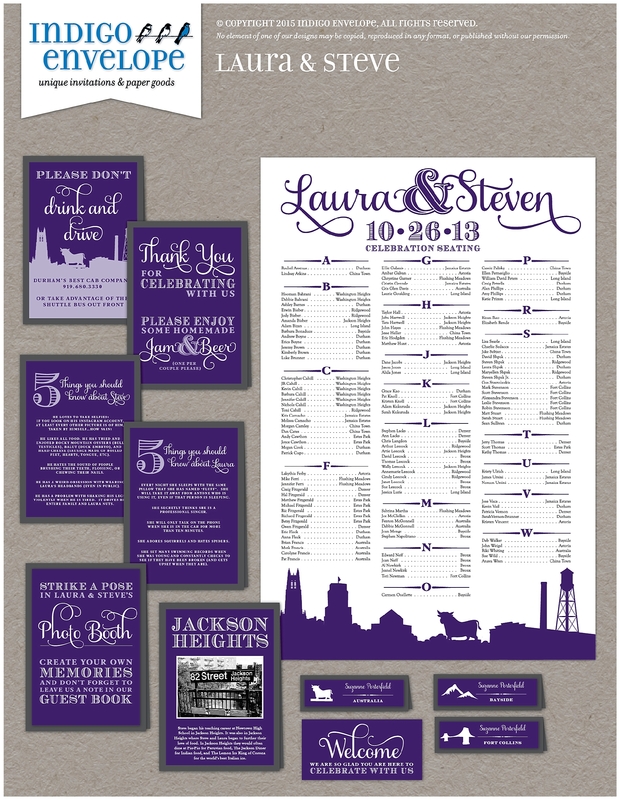 The designs showed where they “met, loved, and married,” and also included our famous version of the Durham, NC skyline. 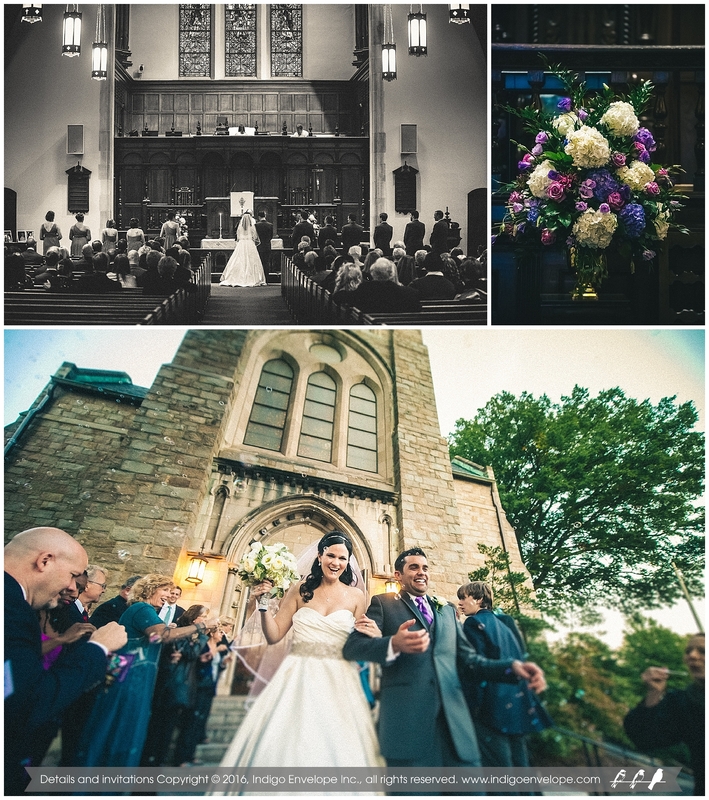 The ceremony for this couple was held in downtown Durham at the gorgeous Trinity United Methodist Church. 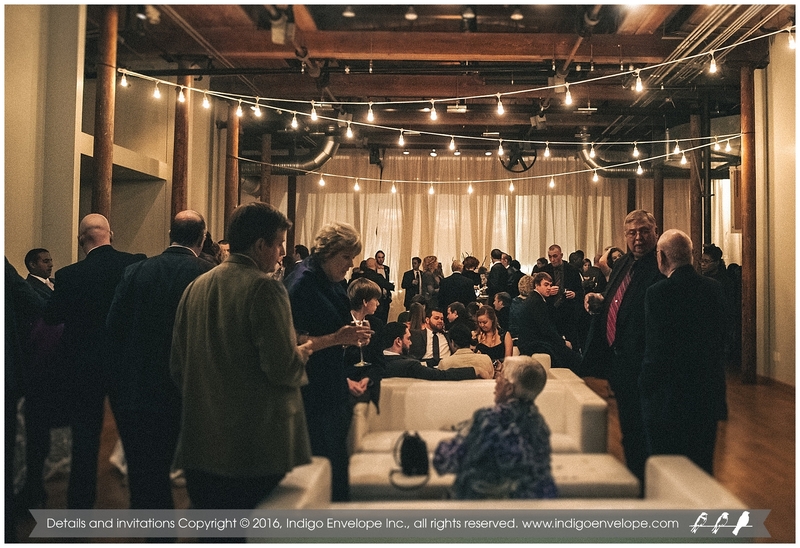 Afterwards, the reception was held at The Cotton Room. 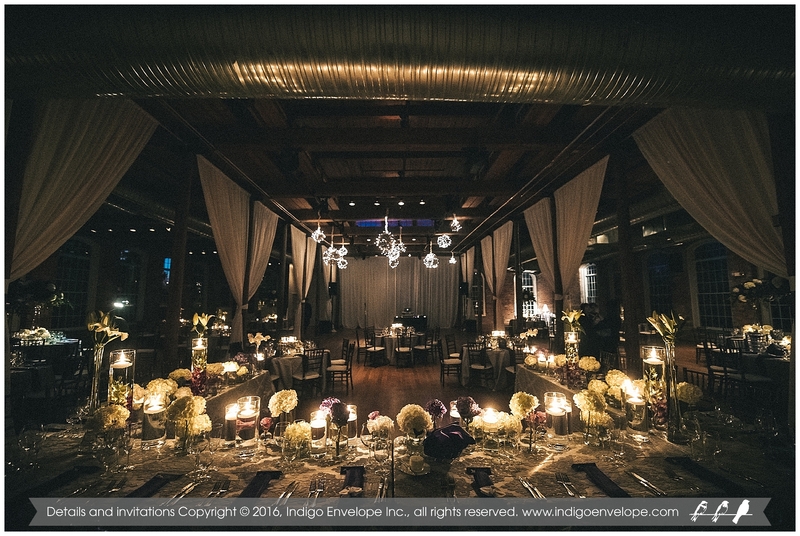 The Cotton Room tied in the couple’s invitation color scheme with beautiful purple and white flowers. 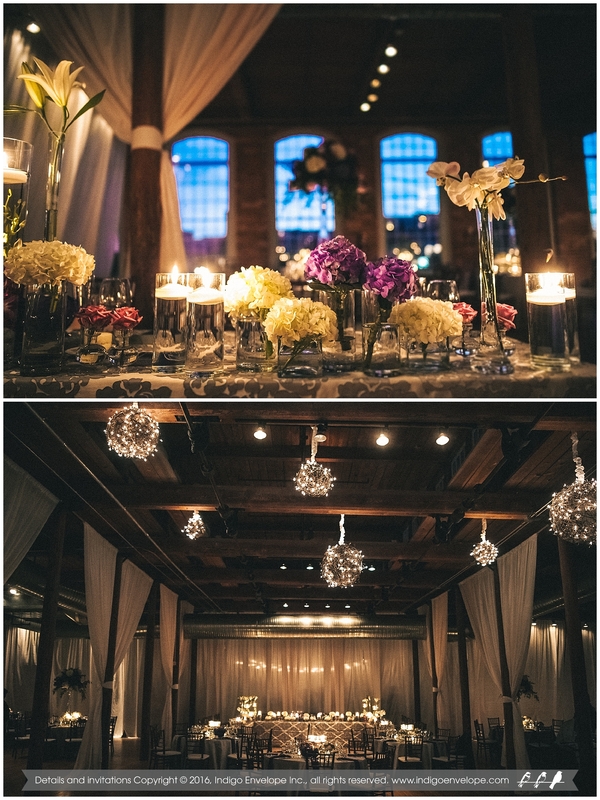 The soft candlelight on the tables and perfectly placed accent lighting really set the tone for the evening. It seems like the smiles on the couple’s faces says it all here. 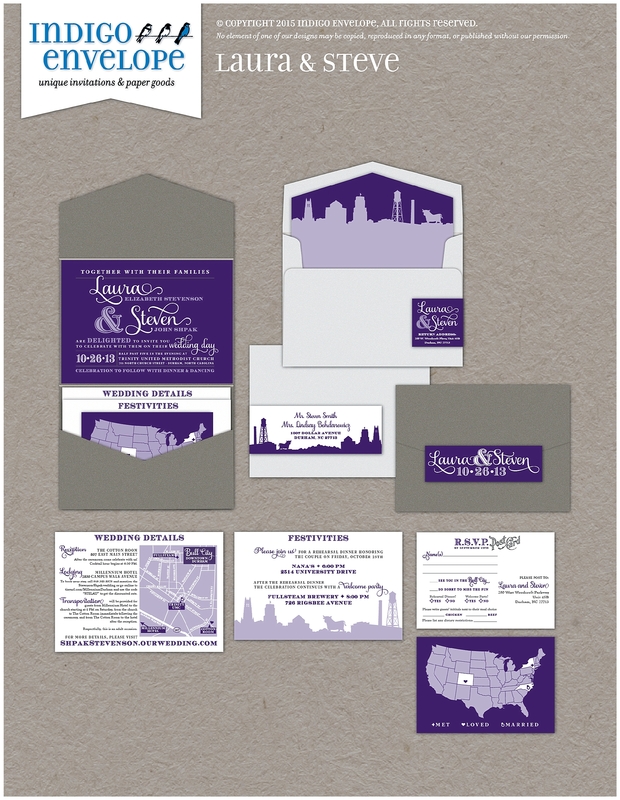 Featured on this invitation is the Durham skyline which accents various pieces such as the envelope liner and programs. For that extra bit of pizzazz, address label wraps are adhered to the envelopes. 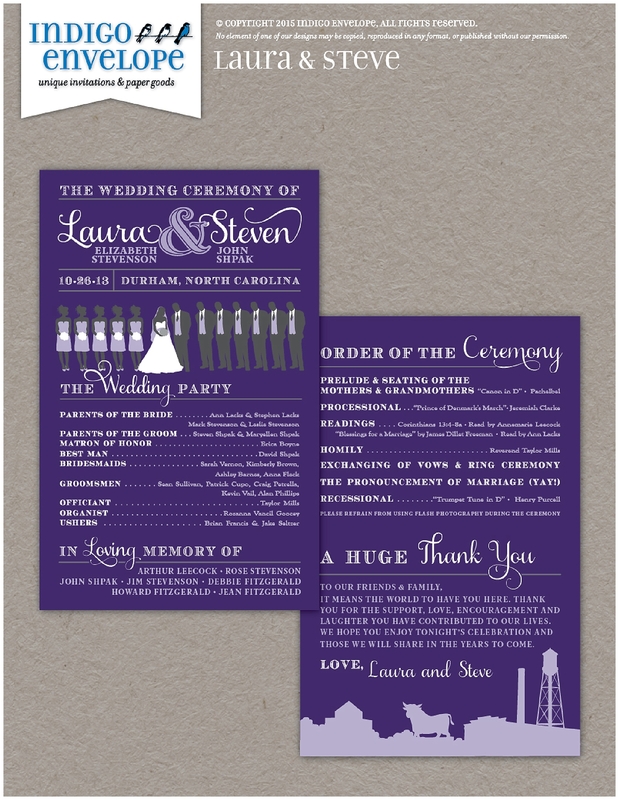 To finish off the Pocketfold™, a rectangular seal with the couple’s names and wedding date is placed on the outside. 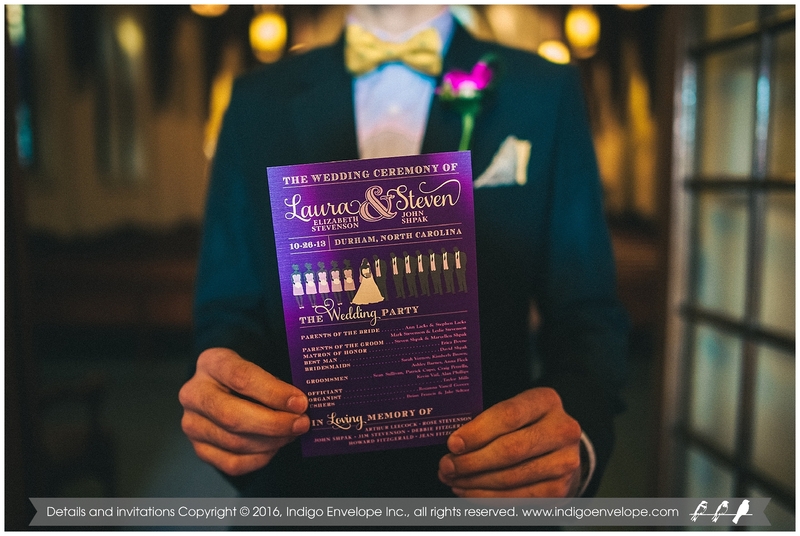 As you’ll see in the programs, the guest’s attention is called to the wedding party and ceremony details with bold graphics that were custom illustrated to reflect the actual people in the event. 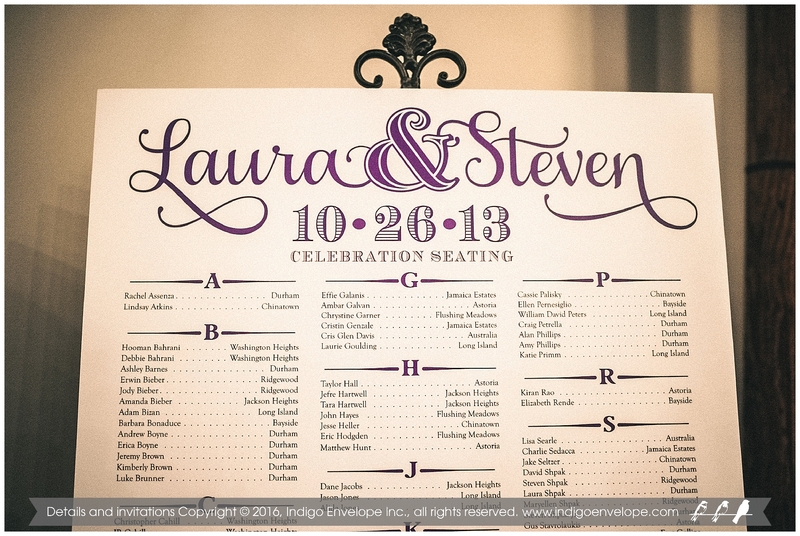 Other touches included our seating chart, which as a large sign was used to enhance the room’s decor. 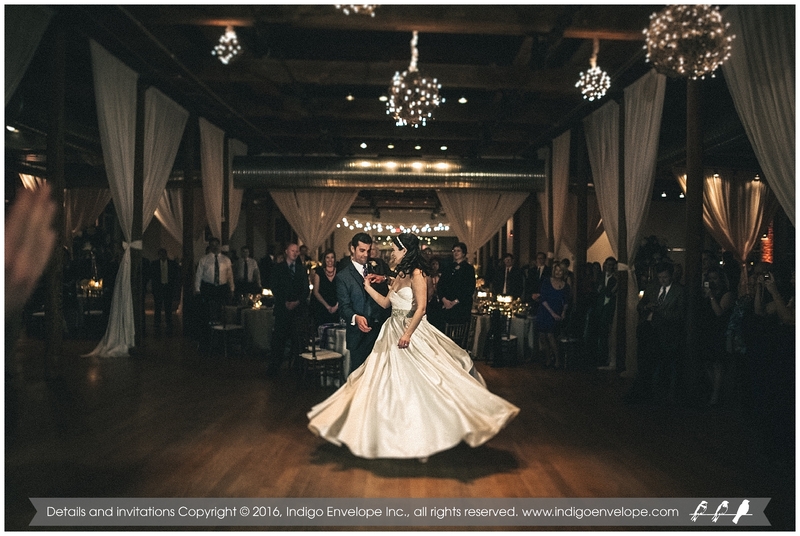 It was important to the couple to give guests a little bit of information about themselves and how they met. 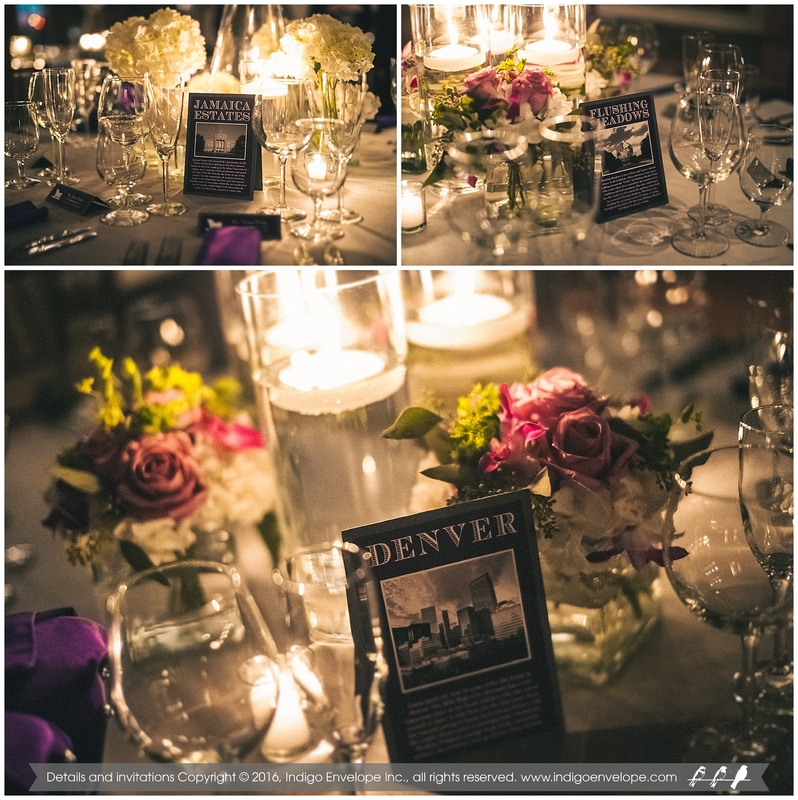 Table tents displayed this information about different places that were special to them. 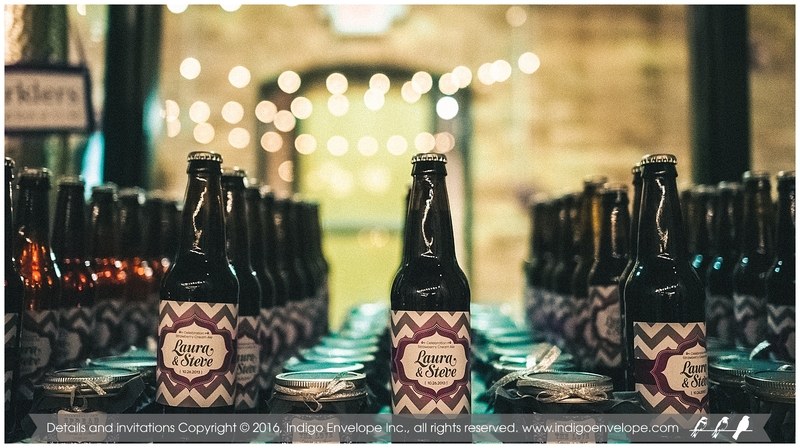 To give everything a super personal touch, personalized labels were made for the beer served at the reception. 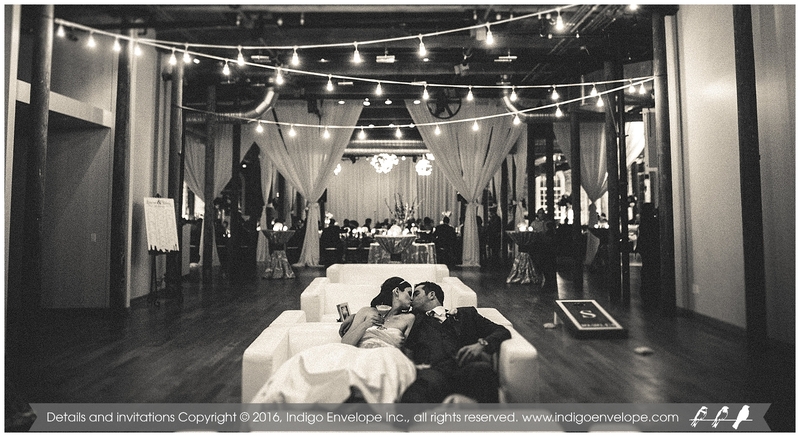 Congrats Laura & Steven and thank you for allowing us to be a part of your special day! 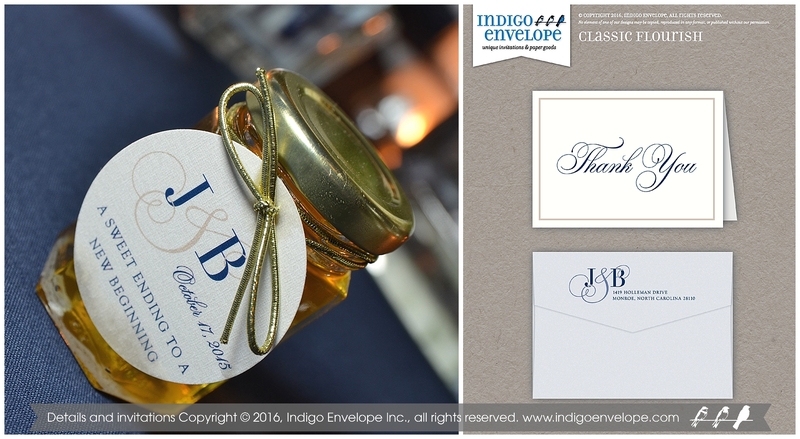 The vision for these traditional navy invitations with a monogram was a classic and Southern wedding for this lovely couple. 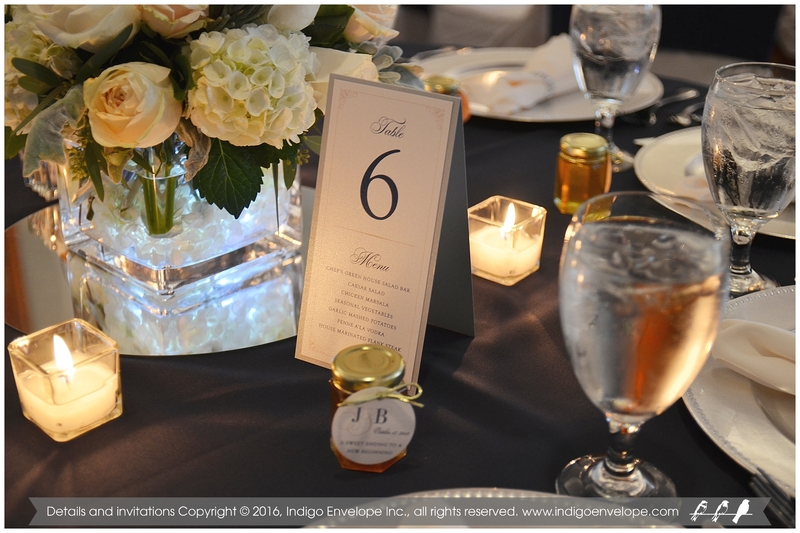 To incorporate some Southern ‘flavor,’ the couple chose to have local jars of honey as their favors. What a sweet idea! 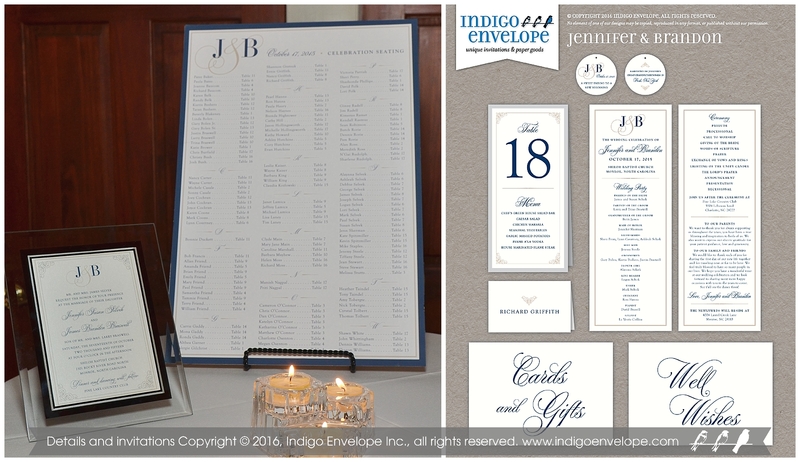 Jennifer and Brandon’s design featured an Envelopments PocketFold™ invitation in navy, which nicely kept together all of the information a guest might need, including RSVP and details cards. 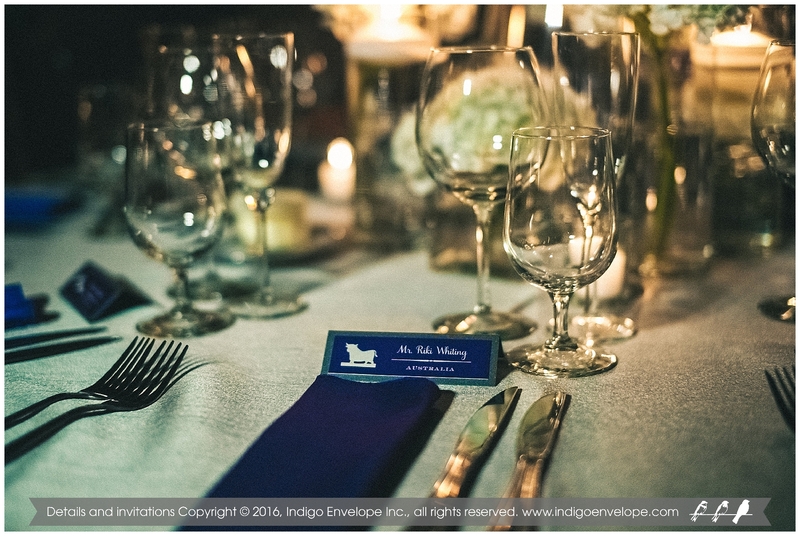 Accented with platinum silver, the navy is formal and traditional, while the metallic silver adds “wow” factor. The focal point was a traditional monogram with their initials, which tied together all of the elements of their suite. 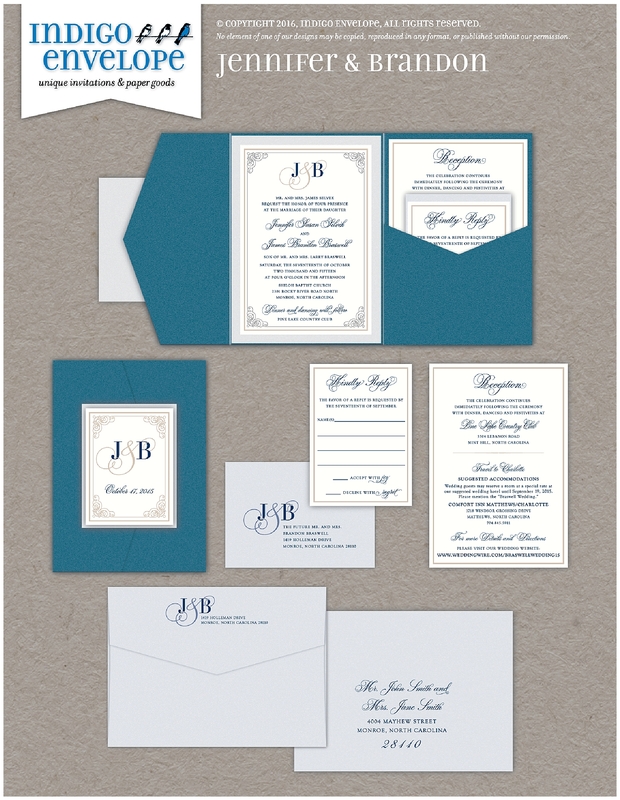 A beautiful digital calligraphy font and classic flourishes were other focal points of the design.